A strip/line of about 50 cm of paper tape (on a table, on the floor). 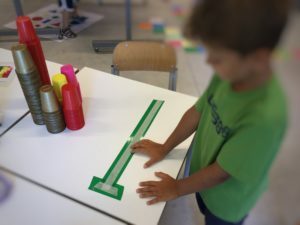 The child, with the paper tape, indicates the starting point of the line using a symbol (following the direction of writing). Then the pupil positions himself/herself in order to have the line in front of him/her. The child has piles of upturned plastic glasses of two different colours at his/her disposal. 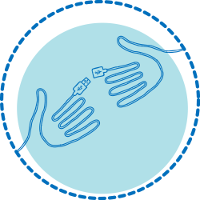 The teacher takes some glasses and puts them into each other, preparing the code. 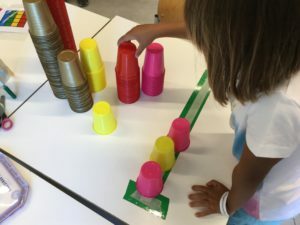 Then the teacher says, “This is the line along which you will have to place the plastic cups” and also says in a loud voice the sequence of colours such as. 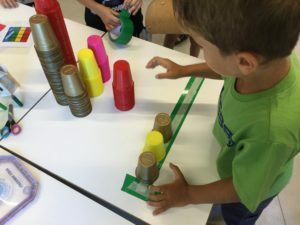 “Pink, gold, pink pink.” The teacher observes the reaction of the children and what they do. Then the teacher repeats the code more slowly if the children did not understand it. He/she repeats it until every player has placed the sequence in the right order, through either self-correction or peer to peer correction. The level of difficulty of the code increases passing from two colours to three, then four and five. 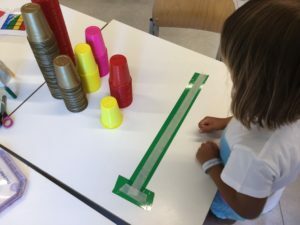 The level will vary according to the level reached by each child.